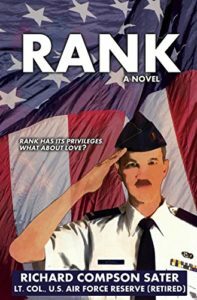 I’ve been eager to read Rank since I heard Richard Compson Sater read from it during Gay Romance Northwest in Seattle back in September. It was as a fantastic read from this debut author so now I’m eager to Sater writes next. The story centers on Air Force officers Lt. Harris Mitchell and General Seamus O’Neill. Early on in the story, General O’Neill brings Lt. Mitchell onto his staff as his aide. It’s a grueling job, one that many before Mitchell have left because the general wants things done his way and if you don’t do them that way he gets very angry. Mitchell makes peace with that and, over a few months, becomes a good aide. What also grows is a crush on the general, who has many traits that Mitchell falls for. For Mitchell, it’s a surprise to find the general is attracted to him too. Even though this book takes place after the repeal of Don’t Ask, Don’t Tell, there are still a few barriers in place for Mitchell and O’Neill. First there’s the rather larger issue that the general is very closeted. The even bigger problem (because, yes, there is one) is that Air Force regulations don’t allow officers of such disparate rank to fraternize. This doesn’t stop the two from having one of the most romantic courtships I’ve ever read. O’Neill is so adorable as he attempts to woo Mitchell and Mitchell is often charmingly bold as he makes his moves on the general. Sometimes it’s uncomfortable for one or both of them. Sometimes it can be funny. Sometimes it’s also heartbreaking. In particular I loved the many (and I do mean many) nicknames O’Neill created for Mitchell–both inside and outside the office. Mitchell’s singular nickname for O’Neill was very heartfelt too. One of the things that made Rank work so well for me is because it took a deep dive into a realm I know little about with the military. The May/December and Boss/Secretary tropes are well used here, but the extra layer of working with military boundaries (and in particular with the General having lived for so long in a DADT world) created many opportunities for great story telling. Sater also managed to turn a mustache into a secondary character of sorts and as a lover of facial hair I thought that was very cool. I hope you’ll pick up this book to experience this wonderful, complex romance.